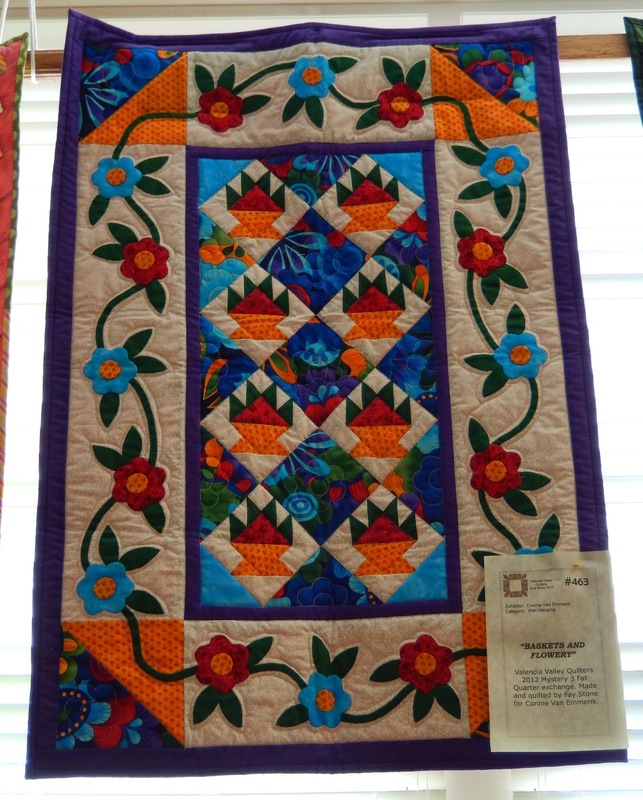 The first weekend in October, I had the pleasure of attending a quilt show hosted by the Valencia Valley Quilters. For your daily dose of inspiration, I bring you some highlights. It's a Beautiful Day in the Neighborhood by Kristin Groman was one of my favorites. 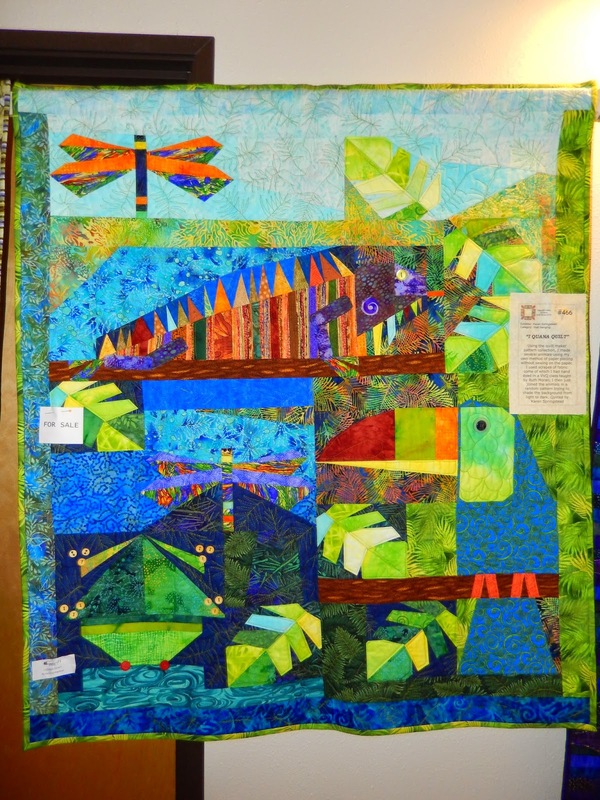 "I wanted to quilt in fun elements of a neighborhood. I made up the quilting as I went with no pattern or markings, just free-forming a lemonade stand, laundry, a cute trailer, etc. The house pattern is from Moda Bakeshop; the quilting is all mine. Pieced and quilted by me for me," Kristin Forman wrote of her piece. Houndstooth is always fun, particularly when button eyes are added. The group challenge made me laugh. These self-portraits have plenty of character! There's something very cheerful and sweet about this little wall-hanging. The tag reads, "Valencia Valley Quilters 2012 Mystery 3 Fat Quarter Exchange. Made and quilted by Fay Stone for Connie Van Emmerik." Some quilt catch my attention, and make me keep looking to see what else is there. I Quana Quilt is one of those. Karen Springstead wrote, "Using the Quilt Maker pattern collection, I made several animals using my own method of paper-piecing without sewing on the paper. I used scraps of fabric, some of which I had hand dyed in a VVQ class taught by Ruth Moran. I then just joined the animals in a random pattern, trying to shade the background from light to dark." I thought this was a great challenge. I wonder if they had a workshop on portraiture because they are all so well done. oh I love the around the neighborhood one too! And your new profile photo is very nice! I think the quilting really adds character to the overall design. Jessica Inman (http://www.jessicainmanphotography.com) did family photos for us. She's great with the kids, and always manages to get great shots, even when they are acting very noncooperative. I asked her to take a few individual pics of me since I got tired of cutting my head out of group shots when someone request a photo for quilting-related endeavors.